Ready to learn Latin dancing? Rockin' Horse Dance Barn has been teaching all the popular Latin dances including the Cha Cha, Merengue, Rumba, Tango and Salsa for 0ver 25 years! 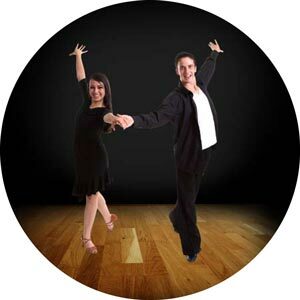 Our Latin Dance Classes Run the Gamut of Traditional Latin Dances. Latin dance refers to types of ballroom dance and folk dance that originated in Latin America. [Wikipedia] There are several different types of Latin Dance. At the Rockin’ Horse Dance Barn, we specialize in teaching Salsa, Cha-Cha, Tango ad Rumba. Cha-cha adds fun to your dancing through its syncopated steps and many open movements. When you can dance many interesting combinations with ease, you and your partner will be able to feel the pulsating Latin rhythms which make this dance so fascinating. It works with music from Latin, Big Band and Country to Top 40. Click here for Cha-cha Dance Lessons, class schedules, syllabus and music suggestions. Learning the Rumba is a prerequisite for good Latin Dancing. The Cuban Motion is essential in most all Latin dances. The Rumba is used by good dancers everywhere and provides interesting variety suited to a limited space. Neat, attractive, precise footwork gives you confidence in your dancing. Click here for Rumba Dance Lessons, class schedules, syllabus and music suggestions. Salsa is the Spanish word for “sauce” denoting a “spicy” and “hot” flavor to this popular dance style to a complex mix of many different rhythms. Many of the patterns are closely related to those of the Mambo and Cha-cha. Click here for Salsa Dance lessons, class schedules, syllabus and music suggestions. In order to achieve the distinctive style of the Tango it is important to develop controlled staccato footwork, along with fluid graceful movements. The unique rhythm of the music is great training for timing and phrasing which develops as the dancer becomes more proficient. Tango practice is essential towards becoming a good dancer. Click here for American Tango Dance Lessons, class schedules, syllabus and music suggestions. Join in on the resurgence of the original Argentine tango. It is a very passionate and sophisticated dance. Learn to glide smoothly across the floor. Partners are recommended but not required. Some dance experience recommended. Click here for Argentine Tango Dance Lessons, class schedules, syllabus and music suggestions.